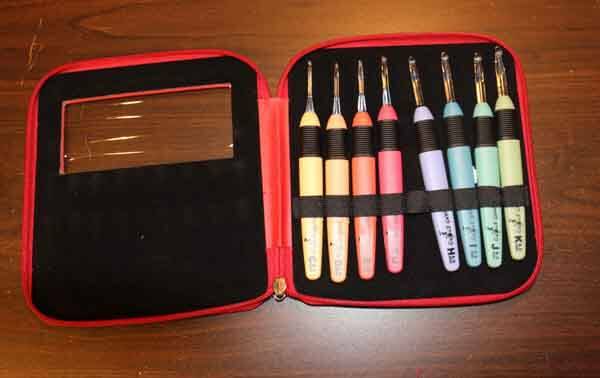 These light up crochet hooks will allow you to crochet in the dark! We like this set by Yarn Story as they come with a full range of hooks that all have led lights in them. Watch our video review to learn more about these hooks. If you like these hooks, please see our links below for places to purchase. We were not asked to review these hooks. We are not being compensated for this review by the manufacturer. If you purchase these hooks sets through our links below, we will earn a small commission on the sale. The hooks will not cost you any more, Amazon just gives us a commission for referring you. Thanks in advance for purchases made through our links as you help to keep this site going! 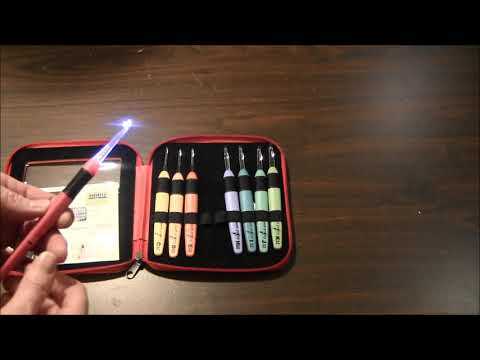 Click to watch the Light Up Crochet Hooks Product Review video in Youtube. 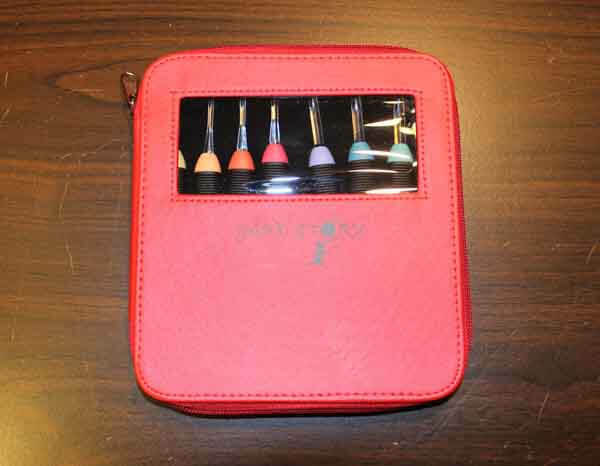 The hook set we purchased came in a compact case and it included crochet hook sized from C through K, 9 hoooks in total. The kit we purchased also came with a bonus seam ripper! I'm missing the G hook from my kit as I must have misplaced it already. I didn't show the seam ripper that came with this kit but it's also lighted! Each hook has a battery and an LED light built in. Take out the small tab to start to use each hook. There is a switch on the side of the hook to turn them on and off. The batteries can be replaced if needed and they take G3-A batteries. Since the hooks are lit by LED light, they will last a long time. I like the feel of these hooks as they have a comfortable handle. Crocheting with the larger hooks works very well. 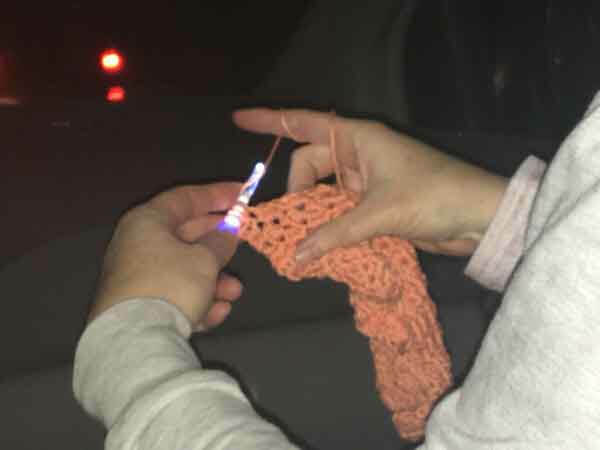 See below for a photo took one day while I was crocheting in the car when it was dark out. I could still continue to stitch even though it was completely dark out. Sorry for the blurriness of the photo. My son took it from the back seat with his phone and since it was dark, it was hard to get a good photo! The one negative about these hooks is that the smaller sizes seemed harder to use for me. The smallest hooks don't have a lot of overhang, so I would not be able to hook the yarn as easily as I would like. I do not use smaller hooks very often as I usually crochet with thicker yarn so this is not a big problem for me. I hope you enjoyed this review and consider purchasing some of these hooks. 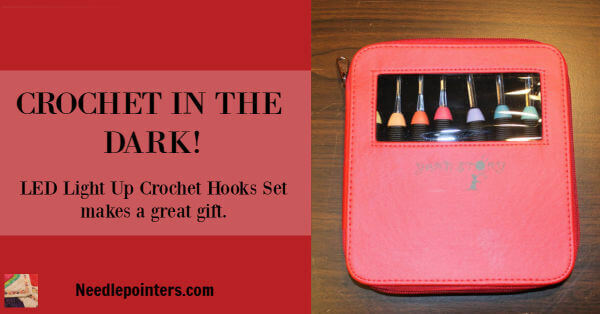 These would make a great holiday or birthday gift for a crocheter.